Caravan, boat and trailer parking available on site. Private wine tastings and Group bookings available on request. > Take Northern Hwy [B75] and drive 10.7 km. > Turn right onto Heathcote-Rochester Road [C347]. > Drive 5km to winery on left. > Take the McIvor Highway [B280] and drive 20kms. > Take the Toolleen-Axedale Road on left and drive 18kms to Toolleen. > Turn right at the Northern Highway [B75] at the Toolleen Hotel. > Drive 4.4 kms to Hagans Lane (just before Welcome sign from Shire of Bendigo). > Two km down Hagan’s Lane, just after Hansel Lane on the right hand side you will see the North side of our vineyard in the distance. > Drive 5km down Hagans Lane to the end. 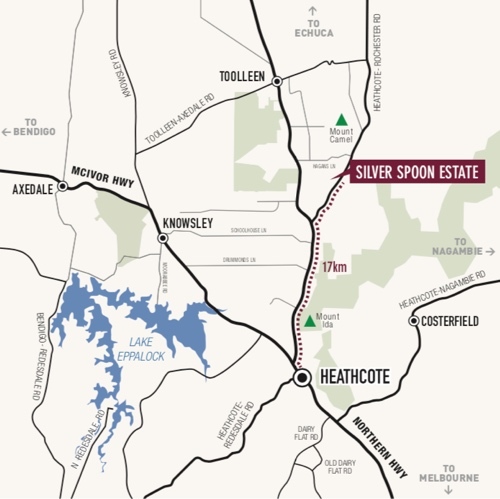 At the T intersection, turn right onto Heathcote Rochester Road and drive 2.3 km to the rock wall entrance to Silver Spoon Estate.